Envirocube is an ultrafiltration membrane with uniform pore size and high rejection capacity. Envirocube modules consist of flat sheet PVDF ultrafiltration membrane cassettes, air diffusers and a product water manifold. Air scouring is provided by the diffusers installed at the bottom of the module which continuously scrubs the membrane surface. A reverse diffusion process takes place at regular intervals by gravity flow of product water from an overhead backwash tank. Also, a cross flow of effluent is provided over the membrane surface. These characteristics result in lower transmembrane pressure and production of consistent water quality on continuous basis. The compact modular design provides the benefit of a higher membrane surface area and ease of membrane cartridge removal during assembly or replacement. Membrane Bioreactor (MBR) is a combination of a membrane process such as microfiltration or ultrafiltration with the activated sludge process, which result in achieving significantly low organic constituents in treated wastewater. The membrane bioreactor technology has gained wide acceptance as new technology for wastewater treatment systems. MBR has many advantages like superior product water quality and a smaller space required for installation and easier operation compared to activated sludge process (ASP). The sludge yield in MBR process is very low. The quality of effluent in MBR is superior to conventional ASP effluent. The effluent from MBR can be reused for industrial applications after RO (Reverse Osmosis) Treatment. MBRs can operate at much higher MLSS (Mixed Liquor Suspended Solids) compared to conventional ASP, resulting in a faster biological reaction and high organic load decomposition in a shorter time or in smaller space. Additionally, as an MBR system operates at a higher MLSS, the sludge yield is quite low, which results in saving in operational cost of the system. Envirocube has been developed after years of research and development that has resulted in an ultrafiltration membrane with uniform pore size and high rejection capacity. Envirocube modules consist of flat sheet PVDF ultrafiltration membrane cassettes, air diffusers and a product water manifold. 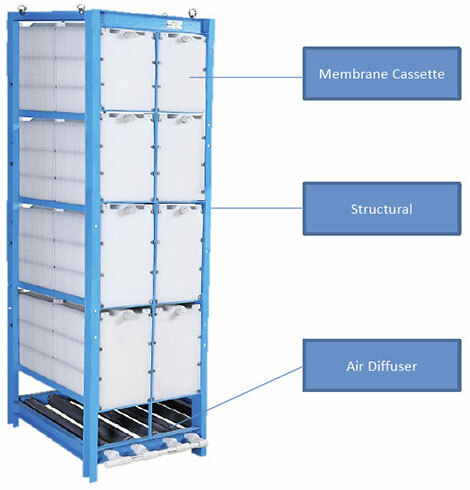 Air scouring is provided by the diffusers installed at the bottom of the module which continuously scrubs the membrane surface. A reverse diffusion process takes place at regular intervals by gravity flow of product water from an overhead backwash tank. Also, a cross flow of effluent is provided over the membrane surface. These characteristics result in lower transmembrane pressure and production of consistent water quality on continuous basis. The compact modular design provides the benefit of a higher membrane surface area and ease of membrane cartridge removal during assembly or replacement. PVDF is used as a base material for flat sheet membrane because of its outstanding oxidative, thermal and hydrolytic stability as well as good mechanical and film-forming properties. The Envirocube membrane has polypropylene fabric as base which helps in producing consistent product quality. Repeated test results for clean water flux during MBR operation has shown very good suspended solid rejection, constant flux values and response for physical/ chemical cleaning. 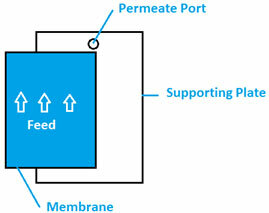 The picture below shows the principle of the filtration for submerged type flat sheet membranes. Sludge and water is clearly separated by the flat sheet submerged membrane. 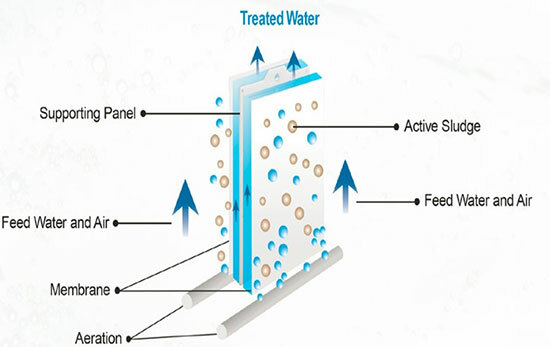 The membrane plate, which has a membrane sealed on supporting plate, is placed vertically in an aeration tank. Cake is formed by filtered activated sludge accumulated on the membrane surface and is scoured off by the air bubbles supplied from the bottom of the membrane elements continuously. 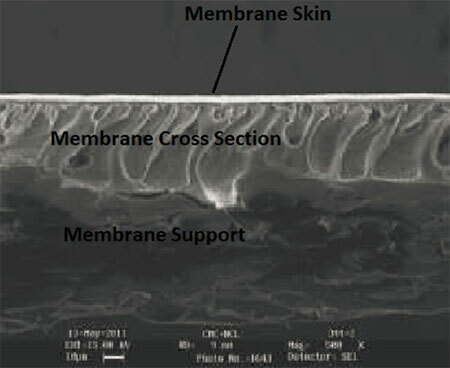 Membranes are sealed on a supporting plate to form the membrane plate. Each membrane plate has 0.18 m2 effective surface area. Fifty-five (55) membrane plates are assembled to form a membrane cartridge with a surface area of 10 m2. Product is collected by common product manifold from each membrane plate. 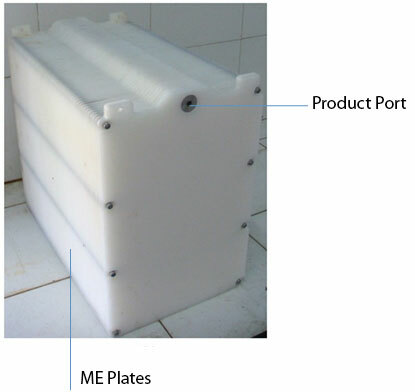 Envirocube membrane module consists of membrane cartridges, air diffuser and permeate manifold. The Envirocube module is submerged in the membrane tank and filtration is carried out with a suction pump. 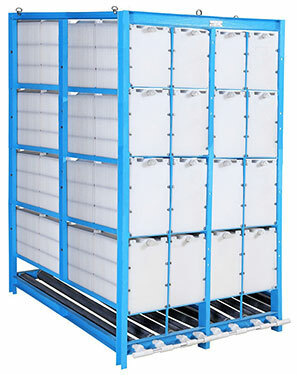 Air is provided from the bottom diffusers which scrub the membrane surface. A backwash tank of recommended capacity should be provided to facilitate periodic backwash of the membrane by means of gravity diffusion. Envirocube is operated in auto mode for filtration and backwash. Chemical cleaning is done manually. The filtration is carried out for 9 minutes, which is followed by a rest period of 1 minute. Backwash of the module is done at a set interval or based on the pump’s high suction pressure. Typical backwash frequency is once every 4 hours.